For the first time in the history of the Cruise Industry on Nevis, a cruise line has committed to making weekly calls to the island for the next two years. Crystal Esprit, will make its inaugural call to the Charlestown Port on November 18, 2017. Mr. Devon Liburd, Director of Sales and Marketing at the Nevis Tourism Authority (NTA) said recently, the Authority is pleased with the cruise lineâ€™s commitment. He described ship as small but high end. â€œItâ€™s a small cruise ship with just about 62 passengers but these are very upscale passengers. The ship itself is an upscale ship and with affluent 1%er passengers. â€œThis is a first for Nevis we will be seeing a cruise ship call on Nevis all through the year. So we are indeed happy for the operators of Crystal Esprit who have decided to make Nevis a choice spot on their itinerary so that we can benefit from the passengers that they will be bringing to the destination,â€ he said. According to Crystal Cruise lineâ€™s website, the Crystal Espritâ€™s visit to Nevis is part of the shipâ€™s debut of an exclusive shore experience with a boutique collection of new all exclusive experiences for its passengers. 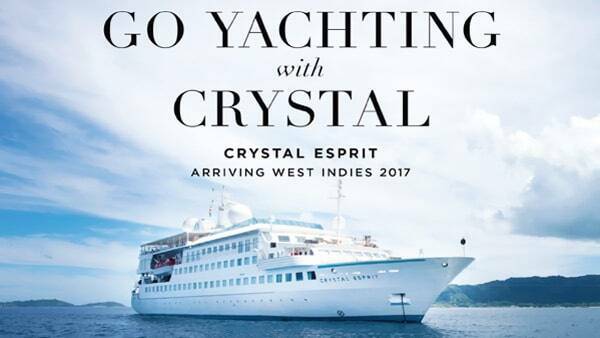 Crystal says it has partnered with equally prestigious names in luxury hospitality and their guests can enhance their yachting adventure with privileged access to culinary, spa, dive and golf outings at exclusive enclaves such as the Four Seasons Resort in the case of Nevis. Meantime, Hon. Mark Brantley, Minister of Tourism and Deputy Premier of Nevis registered his satisfaction with the cruise lineâ€™s addition of Nevis to its itinerary. â€œWe are especially happy that Crystal Cruises will now be coming every week for the next two years and they have made that announcement and so we are quite pleased and that means that we will have some activity even in the off season,â€ he said.